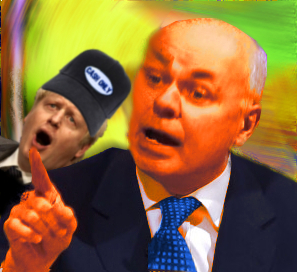 In the wake of London Mayor Boris Johnson’s claim that greed was indeed good, Secretary of State for Work and Pensions, Iain Duncan Smith, not to be outdone, has claimed that all seven traditional deadly sins are fine and dandy and part of contemporary Conservatism. “Boris was quite right,” claimed IDS, “avarice and greed rightly lie at the very foundation of our economic vision, but of course, that is only part of the story. We should work tirelessly and without shame to put all seven at the heart of national life. Please consider signing the WOWpetition which calls for a Cumulative Impact Assessment of Welfare Reform, and a New Deal for sick & disabled people based on their needs, abilities and ambitions. Click this paragraph to find out more. This entry was posted in Uncategorized and tagged boris johnson, boris speech, disability, greed, ids, seven deadly sins, thatcherism, tories, workfare by masterofthememes. Bookmark the permalink.